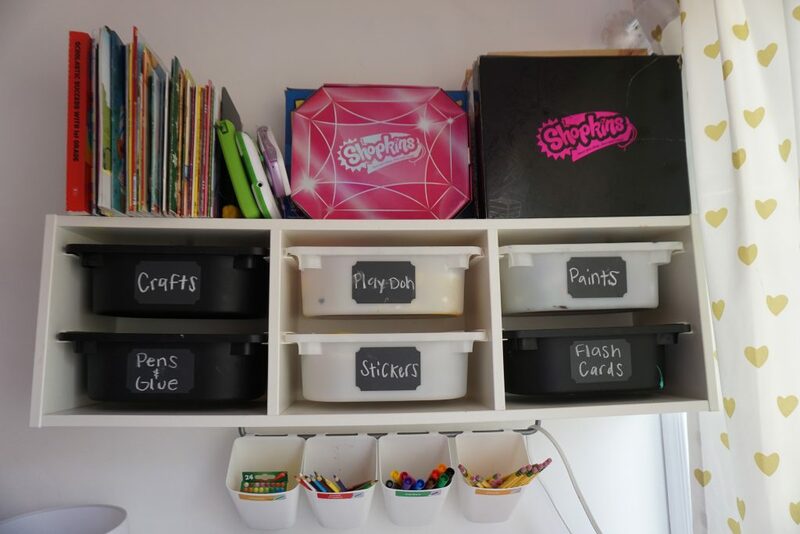 You are here: Home › Uncategorized › Kids Room Tour & Toy Organization Ideas! Hey guys, we spend all day cleaning and organizing the girls room to prep for Back To School 2018! We are organization to make returning to school easier and mornings a breeze. The girls room tour has been my highest requested video, and I do apologize for my delay in sharing. I am still not 100 percent finished with the decorations but so far im happy with the way it turned out. The bunk beds were such a great idea for their room, they sleep so great together and have so much more play space then before. Ikea trofast wall organizer and Ikea FinTorp Rail for hanging the kids crayons, colored pencils, markers and pencils to keep organized for Back To School. Also these Mabel’s Labels classroom labels are so cute and are the perfect visual for the kids. 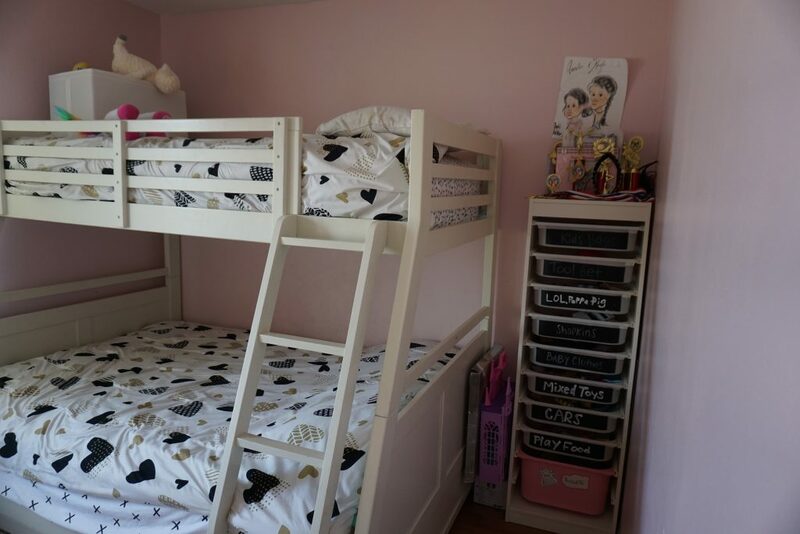 The bunk bed is a full size bed in the bottom and a twin size on the top. the girls still sleep together and I love they have enough space. The Trofast storage combination with boxes keeps toys organized and categorized. I made labels with dollar store chalk board sticks for easy clean up. 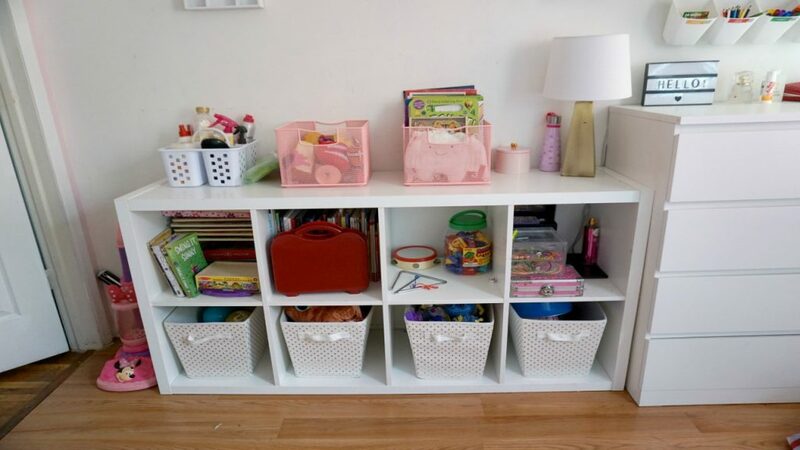 This Ikea Kallax shelf unit makes storing miscellaneous larger toys easy and efficient. The bins are from target and I like that everything match their room decor perfectly. For the full room tour make sure to check the video down below from my Youtube channel Lunamommyvlogs! Xoxo Bye.